New book, 248 pages. Conventional military forces across the world are investigating and adopting measures to be effective in the increasing incidence of irregular wars in order to counter non-state adversaries perpetuating acts of violence in support of causes ranging from extremist political and religious ideologies, transnational crime, local insurgencies and guerrilla wars. Air power is a critical element within the holistic military capabilities of a nation and forms an indelible part of the broader national security apparatus. 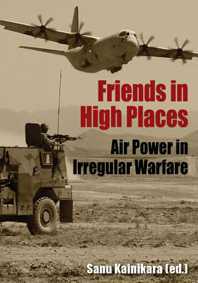 This book looks at the varied and critical contribution that air power makes towards the successful prosecution of irregular wars, from a military perspective. It also analyses the crucial role of air power in the strategic national security policy in relation to the current global trend of non-state entities to wage irregular wars against sovereign nations. This item was added to our catalog on Sunday 04 July, 2010.